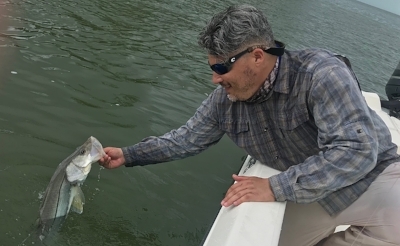 The fishing has been consistent and really good for the last couple months down in Everglades National Park for Tarpon, Snook, Trout and I have been finding some nice Redfish. The mornings start out throwing lures and put a live bait. I fish with adults and their kids and it works out because we cover allot of water. Bruce and his son combined for a boat "Grand Slam". The finger mullet are thick and I have been finding some pilchards. These 2 baits can really produce some great numbers. We are hooking plenty of Sharks and Tarpon on the bigger Mullet. The Sharks are everywhere and every once in a while we loose a great fish to and aggressive Bull Shark, its all part of the game! Mindy usually catches the bigger fish, not today! Its good but really hot and its not bothering the fish at all. The key is to know where to be when the water is moving whether its coming in our going out. Of course some spots are good early before but catching bait evens it out. This is how not to take a picture of your buddies Tarpon, fingers over lens! Newer PostEnd of Summer Fun! Older PostIncredible action in the Swamp!